Three thirteen is a variation of the card game Rummy. It is an eleven-round game played with two or more players. It requires two decks of cards with the jokers removed. Like other Rummy games, once the hands are dealt, the remainder of the cards are placed face down on the table. The top card from the deck is flipped face up and put beside the deck to start the discard pile. The object of Three thirteen is to meld all the cards in your hand into sets. A set is defined by two parameters. The first type of set consists of three or more cards of the same rank, such as 4-4-4. 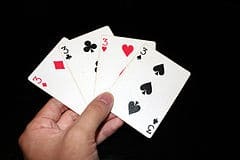 The second type of set consists of a sequence of three or more cards of the same suit, such as 4-5-6 of Hearts. Sets can contain more than three cards, however, you cannot include the same card in multiple sets. Once a player melds all of his cards into sets, he "goes out". He must still discard when "going out" and the remaining players are given one more draw to better their hands. The winner of a game of "Three thirteen" is the player who, at the end of the final round, has accumulated the fewest points. The first dealer, chosen at random, deals three cards to each player. In each successive round, the deal passes to the left. In the second round, the dealer deals four cards to each player. With each successive round, the number of cards dealt to start the round increases until the eleventh and final round in which thirteen cards each are dealt. In each round there is a designated wild card. The wild card is the card equal to the number of cards dealt. In the first round, three cards are dealt, so Threes are wild cards. In the second round four cards are dealt, so Fours are wild. Wild cards can be used in place of any other card in making a group or sequence. A player can only use one wild card in each set. At the end of a given round, each of a player's cards that cannot be placed into a set counts towards his score. Any wild cards that remain unused in a player's hand at the conclusion of a round count as 15 points. According to some rules, Aces can be used as high or low in a sequence. In this case an Ace remaining in your hand at the end costs 15 points, rather than one. Some rules score 11 points for Jacks, 12 for Queens and 13 for Kings. An extra round (twelfth) or two (thirteenth) where there are 14 and 15 cards dealt for each player and Aces and 2s are wild respectively. Some call it "Fourteens" or "Fifteens". Some rules designate Jokers as additional wild cards. In that case, a joker left in a player's hand at the conclusion of a round counts as 20 points. In other variations, Jokers as wild cards can be discarded onto any pile of any other player and count for no points. Another variation plays 22 rounds starting from 3 to 13 and then back down from 13 to 3. Some rules state that a player can make a set that consists only of wild cards.